Jullundur (jalandhar) surgicals enterprises are engaged in manufacturing and supplying the high quality assortment of peak flowmeter. 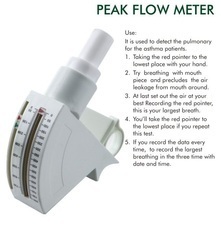 The peak flow meter is a scientifically designed portable device to measure lung capacity or airflow in the lungs. It offers an easy and quick way to measure peak expiratory flow which helps you to monitor and control your asthma conditions as well as lung function. SpecificationsMeets or exceeds the 1997 National Asthma Education and Prevention Program (NAEPP) recommended technical guidelines for peak flow meters based on the "Standardization of Spirometry: 1994 Udate". Official Statement of the American Thoracic Society (ATS). - Experts agree, the best way to manage asthma is at home allowing more effective control, improving quality of life and the need for less medical intervention. - Vital data for your lungs functioning. Glass Agencies are manufacturer of hand held Peak flow meter. The Digital Peak-Flow Meter we bring onward is device that accurately calculates Forced Expiratory Volume in 1-second (FEV1) and Peak Expiratory Flow (PEF) in adults and children. PEF is the speed of air being blown out of the lungs after inhalation and FEV1 is the volume of exhaled. This helps find out the working of lungs and monitor breathing process. Peak flow readings are higher when patients are well and lower when the airways are constricted from changes in recorded values, patients and doctors may determine lung functionality, severity of asthma symptoms and treatment options. People with asthma may benefit from regular peak flow monitoring. 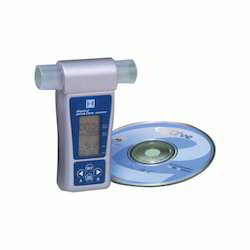 Peak Flow Meter is used to measure a person´s "Peak Expiratory Flow", wich is the fastest speed a person can blow air out of the lungs after taking in as big a breath as possible. It will help you find out if there are changes in your air flow. - Portable & easy to use. JK Medical System Pvt. Ltd.